Amy Walsh Fitness: Clearcreek Fitness Bootcamp Hits Front Page Print and E-News! Clearcreek Fitness Bootcamp Hits Front Page Print and E-News! 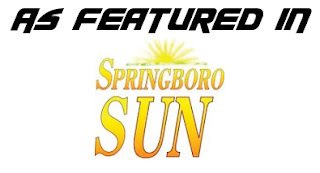 A great article on Clearcreek Fitness Bootcamp was recently featured on the front page of the Springboro Sun. You can read the article online. Spaces continue to fill up as our sale has now also been featured on Groupon for the June bootcamp dates. Reserve today by visiting the Fitness Bootcamp page today so you don't lose your spot!